Lawrence is a city in Eastern Kansas, USA along I-70, 35 miles (56 km) west of Kansas City, Kansas. It is home to the University of Kansas. Lawrence provides a mix of academics, bohemia, and small-town Kansas kitsch. It has been the setting of many movies and is a growing cultural hub in Kansas. Lawrence is a college town with ideologically diverse residents. 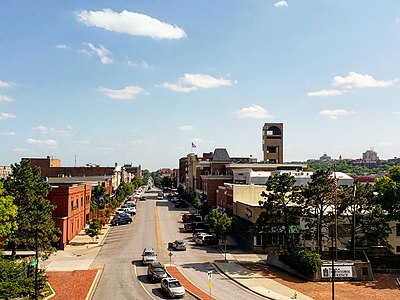 Two universities are located in the town - the older and more historic University of Kansas, with a campus spanning from downtown Lawrence to west Lawrence, and the federally funded Haskell University in southeast Lawrence. There are also many historic settings, as this city was among the first in Kansas and shaped the cultural and political landscape of Kansas for generations to come, at its founding. Today, it is a cultural hub in the state, with several theaters, restaurants, music venues, bars, clubs, churches, and landmarks. This town, and the surrounding county, is oozing with history from the pre-Civil War Bleeding Kansas era, and there is much to explore. Interstate 70. On the north edge of town. State Highway Kansas 10. Access from southwest metropolitan Kansas City on the south edge of town. US 24 and US 40. East-west access from Topeka and Kansas City (24 immediately north of town and 40 through the center of town). US 59. North-south access from Ottawa and Atchison through the center of town. The K-10 Connector (RideKC Route 510). The K-10 Connector runs between Overland Park and Lawrence on weekdays. Services are limited during KU summer term and school breaks and holidays. $3 one-way. Amtrak provides one daily service via the Southwest Chief route. Westbound trains, from Chicago bound for Los Angeles stops just before midnight while eastbound trains rolls in to Lawrance early morning. The 38.971258-95.2303812 Lawrence Amtrak station is at 413 E 7th St. There's no bus stop directly at the station, however 7th & New Hampshire station is just a few minutes walk away. The central part of the city, consisting of the downtown, the KU campus, and the student-filled neighborhoods in between is easily walkable. The Lawrence Convention & Visitors Bureau's Visitor Information Center offers brochures for self-guided walking tours in the city. Outside of the central part of the city, cars are king. Cabs are cheap, though uncommon. Lawrence has a fairly good and inexpensive bus system, known as the T. The fare is only $1 and will get you one transfer or you can pay $2.75 for a day pass. The website is on Lawrencetransit and there a bus to the overland park campus k-10-connector [dead link]. The transit stops are on Google transit and searchable there, except for the k-10 connector. Jayhawk Taxi, 850 E 13th St, +1 785 843-8294, M-Sa Hotline Open at 8AM. Ground Transportation Inc. 301 Maple St, +1 785 838-4500. $9 anywhere in town, 24/7 hours open. Lawrence Taxi +1 785 304-6748. Th-Sa Part-time. Uber is also available in Lawrence, as far as the south border of Douglas County, and up to Lecompton, Kansas. The city is relatively bike-friendly, and has had a good reputation among the biking community. 38.958611-95.2438892 University of Kansas Natural History Museum, 1345 Jayhawk Blvd (Catch the #11 bus from 7th street and Vermont in downtown. ), ☎ +1 785-864-4450. Tu-Sa 9AM — 5PM, Su noon — 4PM; closed on Mondays and major holidays. See the Panorama of North American Mammals and Comanche, the famous horse. Free but donations of $7 adults, and $4 children are accepted. There's an interesting rock mural on North Side of the river which was created by local artist Stan Herd. It is visible from the Massachusetts Street Bridge. 38.9616245-95.24213174 Solidarity Library, 1204 Oread Ave. community-run library of over 4,000 rare & radical books and zines). free. Kansas Football. The Jayhawks play their home games in Memorial Stadium. In recent years, the football program has seen troubled times from coaching changes, but Memorial Stadium is regarded locally as one of the most underrated Division I stadiums in the country. Kansas Soccer. The Jayhawks play women's college soccer at Rock Chalk Park in west Lawrence. They compete in the Big 12 conference. Kansas Baseball. The Jayhawks play their baseball games in the heart of Lawrence, in Hoglund Ballpark, just south of Allen Fieldhouse. 38.9358-95.36831 Clinton Lake State Park, 798 North 1415 Rd, ☎ +1 785-842-8562. The park is located just outside of town and provides opportunities for boating, fishing, hiking, hunting, and camping. University of Kansas, home of the Spencer Museum of Art, the Museum of Natural History (Dyche Hall), the "Lone Survivor" of the Battle of Little Bighorn, and the Dole Institute of Politics at 2350 Petefish Drive. The flagship university of the state of Kansas, and regarded as one of the most beautiful university campuses in the Heartland. Massachusetts Street is the downtown shopping district. One can find anything from incense burners to sporting goods. Allergy sufferers, take note: several local merchants (the Dusty Bookshelf, Love Garden Sounds, and Sunflower Outdoor) have resident cats. The 23rd Street in the south has many shopping places and Iowa/31th Street is home to Walmart, Target, Home Depot, Lowe's, Chick-fil-A, Hobby Lobby, Best Buy, and other big box stores. 38.96877-95.235681 Limestone Pizza, 814 Massachusetts, ☎ +1 785 856-2825. Delicious, locally sourced, minimally processed & hand-crafted pizza. Pizza Shuttle, ☎ +1 785-842-1212. Dirt cheap, open late. Everybody's top choice for post-bar dining. Pyramid Pizza, 701 W 9th St, ☎ +1 785 842-3232. Great pizza. Open Late. City-wide Delivery. Everyday walk-in special. 38.97049-95.236192 Bigg's on Mass, 719 Massachusetts. Barbecue. 38.96573-95.235173 India Palace, 124 E. 10th St, ☎ +1 785 331-4300. Authentic Indian food. Lunch buffet every day. 38.9591-95.278614 Jade Garden, 1410 Kasold Dr, ☎ +1 785 843-8650. Chinese and Vietnamese food. Delivery available for orders over $10. 38.96935-95.308345 Johnny's Tavern West, 721 Wakarusa Dr. Pizza, sandwiches and other bar food. Great place to watch a game or play pool. Kokoro, 601 Kasold Dr, ☎ +1 785 838-4134. Japanese grill and sushi. 38.97098-95.235546 Rudy's Pizzeria, 704 Massachusetts, ☎ +1 785 749-0055. Unassuming location with great pizza. Free delivery. 38.97241-95.278658 Tortas Jalisco, 534 Frontier, ☎ +1 785 865-1515. Authentic Mexican food. Thai Siam, 601 S. Kasold Dr, ☎ +1 785 331-2525. Thai and Chinese food in what used to be a Subway (really). 38.94314-95.258439 Yello Sub, 1814 W. 23rd St, ☎ +1 785 843-6000. Locally owned sandwich shop with a number of vegetarian options. Delivery available. 38.96891-95.2361910 Zen Zero, 811 Massachusetts, ☎ +1 785 832-0001. Thai, Nepalese, and Japanese noodle shop. Prices are low, and the atmosphere is casual. 38.96529-95.2361611 Encore Cafe, 1007 Massachusetts St, ☎ +1 785-856-3682. Specializes in Asian-American food, as well as bubble tea. Karaoke rooms available. 38.96972-95.234941 The Bottleneck, 737 New Hampshire, ☎ +1 785 841-LIVE (5483). 6PM-2AM. Live music venue featuring a range of local and national rock music. 38.97191-95.235622 Free State Brewing Company, 636 Massachusetts, ☎ +1 785 843-4555. This microbrewery and eatery claims to be the 'First Legal Brewery in Kansas'. Monday nights offer $1.50 pints of tasty microbrew. 38.96496-95.235533 Fatso's, 1016 Massachusetts A Pl, ☎ +1 785 865-4055. To have a beer and enjoy some live music most nights of the week. Wednesday nights are the busiest here and usually have the best drink specials. 38.96522-95.236194 Louise's, 1009 Mass, ☎ +1 785-843-9032. One of the few Lawrence bars frequented by both locals and students, featuring pool tables, foosball, and a double-decker heated outdoor smoking deck. 38.96583-95.235676 Replay Lounge, 946 Massachusetts St, ☎ +1 785 749-7676. Lawrence's home for local and national punk and indie rock. It's also has a collection of pinball machines and a large heated smoking porch to keep you from shivering while you smoke and swill your PBR. 38.971034-95.2363241 The Eldridge Hotel, 701 Massachusetts St, ☎ +1 785-749-5011, e-mail: info@eldridgehotel.com. The Eldridge Hotel is on the National Register of Historic Places - as one of the buildings that Quantrill burned during his raid of the city in 1863. It was renovated in the spring of 2005. Room rates climb higher the weekend of KU graduation. $120-$145. 38.965392-95.240352 Halcyon House Bed & Breakfast, 1000 Ohio St, ☎ +1 785-841-0314, toll-free: +1-888-441-0314. A lovely bed and breakfast with rooms to suit most budgets. Within walking distance to the city center (and all the shopping and eateries on Massachusetts St.) and the University of Kansas. Delicious homemade breakfast that will give you a good start to the day. Helpful tourist information is provided by the owners upon request. $55-149. 38.962174-95.2425673 The Oread Hotel, 1200 Oread Ave (Located beside the campus of the University of Kansas. ), ☎ +1 785-842-1200, toll-free: +1-877-263-6347, e-mail: info@theoread.com. The Oread is a unique center for lodging, hospitality, business and social leisure activities. This city travel guide to Lawrence is a usable article. It has information on how to get there and on restaurants and hotels. An adventurous person could use this article, but please feel free to improve it by editing the page. This travel guide page was last edited at 16:51, on 24 April 2019 by Wikivoyage user Mbrickn. Based on work by Wikivoyage users Ikan Kekek, Ronhjones, JakeOregon, Marshan3q, Traveler100bot, Ground Zero, Wrh2Bot and Dale Arnett, Wikivoyage anonymous user 96.44.3.25 and others.